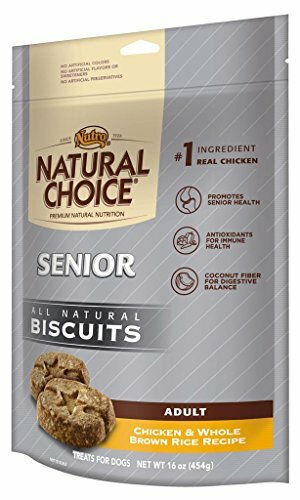 NATURAL CHOICE Adult Dog Biscuits - Chicken NATURAL CHOICE Adult Dog Biscuits with Chicken are 100% natural with vitamins, minerals and other nutrients and contain no artificial flavors, colors or preservatives, making these biscuits perfect for training or as a special treat for your dog. These natural dog treats are made with real chicken to support lean muscles and the high metabolism needs of your pet. No Matter the Size or Breed, We Have a Dog Treat for You Big or small, there is a chicken-flavored NATURAL CHOICE Dog Biscuit for your pet. The chicken and whole brown rice recipe is complete with natural ingredients to support a healthy dog at any stage of their life. Available Flavors • NATURAL CHOICE Small Breed Adult Dog Biscuits Chicken & Whole Brown Rice Recipe (8-oz) • NATURAL CHOICE Large Breed Adult Dog Biscuits Chicken & Whole Brown Rice Recipe (32-oz) • NATURAL CHOICE Puppy Biscuits Chicken & Whole Brown Rice Recipe (16-oz) • NATURAL CHOICE Senior Dog Biscuits Chicken & Whole Brown Rice Recipe (16-oz) click to view product NATURAL CHOICE WHOLESOME ESSENTIALS Dry Dog Food NATURAL CHOICE WHOLESOME ESSENTIALS dog food holds the key to a balanced diet: a dry food with the #1 ingredient of great tasting, farm-raised chicken, and oatmeal for sensitive stomachs. click to view product NATURAL CHOICE Dog Biscuits – Health Benefits NATURAL CHOICE Dog Biscuits come in a variety of special formulations which cater to dogs that may need treats that support specific health benefits. click to view product NATURAL CHOICE Canned Dog Food, Featuring Health Benefits Made with premium natural* ingredients, including real proteins, NATURAL CHOICE Canned Dog Food provides a delicious taste your dog will enjoy, and health benefits you can see. *with vitamins, minerals and other nutrients click to view product NUTRO Crunchy Treats These healthy treats contain no artificial colors, flavors or preservatives, so you can feel good rewarding your dog with delicious NUTRO Crunchy Treats. No flavor choice Milk Bone dog biscuits 12 vitamins and minerals Made for small or medium size dogs 5 assorted flavors24 oz This supplement is for animal use only. Keep out of reach of children and other animals. In case of accidental overdose, contact a health professional immediately. Consult with your veterinarian before using this product. Due to the personal nature of this product, we are unable to accept returns.